In recent days the BBC Jerusalem Bureau’s Yolande Knell has produced two very similar reports on different platforms concerning illegally built structures in the South Hebron Hills. 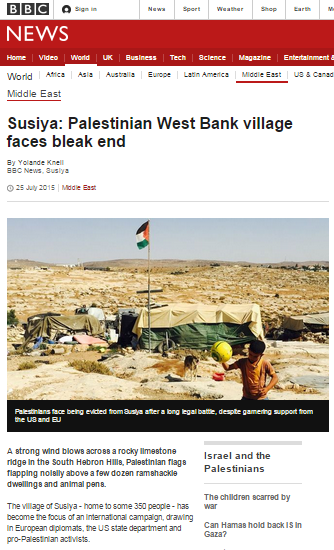 On July 25th an article appeared in the ‘Features’ section of the BBC News website’s Middle East page under the title “Susiya: Palestinian West Bank village faces bleak end“, where it remained for three consecutive days. That portrayal is inaccurate and misleading. “During the years while the legal proceedings were ongoing, the petitioners continued to expand their illegal construction, raising the number of structures to a few dozen. They exploited a cease and desist order that temporarily prevented Israel from demolishing the illegal structures. On 4 May 2015, the Supreme Court declined to issue another temporary injunction preventing demolitions. The Court found that the petitioners chose to continue to build illegally in violation of judicial rulings that were meant to facilitate the examination of the situation in its entirety, including the actions of the Israeli authorities. Both Knell’s reports include considerable input from one Nasser Nawaja – described by her in the audio report as “one of about 350 villagers” and in the written report as a “Susiya resident”. Whilst those descriptions may indeed be accurate, Mr Nawaja’s position as a community organizer and a field researcher for the political NGO B’Tselem is highly relevant to this story. But – in breach of the BBC editorial guidelines on impartiality which state “[w]e should not automatically assume that contributors from other organisations (such as academics, journalists, researchers and representatives of charities) are unbiased and we may need to make it clear to the audience when contributors are associated with a particular viewpoint, if it is not apparent from their contribution or from the context in which their contribution is made” – Knell refrains from telling audiences about her main interviewee’s day job or his worldwide promotion of a libel which has darkly medieval overtones. As NGO Monitor reports, B’Tselem is one of a number of foreign funded political organisations involved in promoting the Susiya campaign. “Khirbet Susiya (Susya) is a small Arab village in the South Hebron Hills. There are widely divergent narratives regarding the village and its history; according to Israeli authorities, the village’s structures have been illegally built. A protracted court battle ensued regarding the demolition of the village. Anyone who has travelled around Area C in the past few months will not be surprised by that revelation of pirate construction of EU-funded structures in places which according to the Oslo accords are under Israeli control – including planning and zoning. The road from Jerusalem to the Dead Sea, for example, offers an excellent view of dozens of relatively recent structures bearing the EU flag. Instead, Knell’s pathos-rich accounts clearly steer audiences towards her desired take away messaging. In addition to failing to mention that the High Court of Justice found that the families in Susiya already have homes in the nearby village of Yatta in Area A, Knell refrains from telling her readers and listeners that the Israeli government has offered the residents an alternative. Yolande Knell’s failure to tell audiences the whole story and her concealment of the fact that her main interviewee is an employee of one of the political NGOs involved in the public relations campaign promoting the one-sided Susiya narrative is ample indication of the fact that these two reports – once again – have more to do with political activism than accurate and impartial news reporting. Why do the BBC Middle Eastern reporters take every possible opportunity to blacken Israel’s positive image ? Why ? Because that’s what they are paid by both the BBC and the PA to do. Simples ! Call them what they are, ARAB SETTLERS!